By the time this posts, we will be well into the Christmas season. The shopping is in full swing. The company Christmas parties are scheduled. Growing up as a kid, the holiday season was something I looked forward to for weeks. The artificial Christmas tree going up with the lights and decorations holds an endearing place in my heart. My mom would bake all types of Christmas candy and cookies which I enjoyed. There were the Christmas programs at church and at school that I would rehearse for and prepare. Most of the time I was playing Christmas carols on the piano. I loved every minute of it. In high school, I was the main pianist for the choir. In among all the good, there were some very rough moments, but the one thing that remained with me throughout my life is Christmas music. It always gave me a smile and a moment of peace. It helps bring in the joy and anticipation of the season. A few years ago, I had the opportunity of creating a CD of Christmas Music for someone to give as a gift. 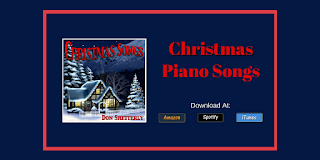 My Christmas Songs CD is a collection of many of my own favorite songs of the season. The CD is filled with simple music played on the piano in just the way I used to play it when I was a kid. It will connect with you emotionally and lift you up in the spirit of the season with joy and peace. I hope you check my CD out. You can listen to it or download it on most of the music download sites. If it doesn't show up in your favorite music store, let me know, and I'll see if I can get them to carry it. If you want, you can also buy the physical CD! The Christmas Songs CD is ideal for family gatherings or Christmas parties. Play it when you decorate your Christmas tree. Use it in the morning where you wake up on Christmas Day and open presents. Please share this blog post with everyone you know. I'm proud of this CD, and this music means something very special to me. Tis The Season For Christmas Music! It is a given in life I think that sometimes things don't go as planned. Sometimes we break into many pieces. When this happens, it is never fun, but sometimes it is necessary. I can look back at my life and see just how many times I felt so broken inside. The moments where I felt like I could not go on and I would not make it. Experiences that felt like they were taking me under as I gulped for my last breath of air. In these moments of life, I felt like I had broken into so many pieces that there would never be a way to put myself together. I didn't believe at those times that I could go on and make it in life. In fact, at one point I went through the paralysis of Conversion Disorder. It felt like walking again was a pipe dream. Through all of those moments, I came to realize that I could make it. I had more strength within myself than I realized existed at that second. When I thought there was no more to get, somehow I reached further down and found more strength. I also came to realize that sometimes when I felt so broken, that it was in those moments where I found my way forward. It almost took the millions of pieces I had become before I could begin to piece life back together. In fact, I think for the junk in life I no longer needed, the pieces had to break. It was the only way out for the stuff that was no longer useful. If I hadn't broken into many pieces, I would have held on to the things forever. In the end, I would not have made it without going through this step. While I know, it isn't easy when your life has been shattered. I know it is difficult to see that this may result in something good. I understand that. However, I know in my own life, and I've got a feeling you do too, that you will make it through this. I've got a feeling that you'll discover strength you didn't know what was present. 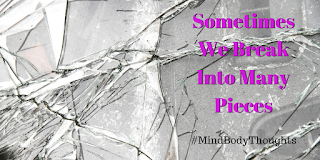 Even though sometimes we break into many pieces, just remember that we can always put ourselves together. When we do this, we often find a much stronger way of piecing our life back, so we're more prepared to take on so much more in the future! Permission required in writing before any part of this blog post from 11/28/17 is reprinted, reworded or used in any form. This was a song I helped create for a Thanksgiving Day exercise. I believe we were going to Faith Baptist Church of Hampton, Iowa at the time. This was an activity we did as a family. I guess because I played the piano it seemed logical. 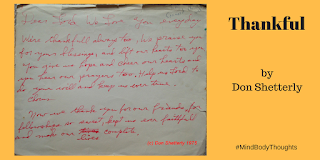 It has been many years since I have seen the words to this and my copy is tattered and worn. To the best of my knowledge and as far as I know, there are no other copies of this song. While it is hard to remember back to 1975 when this was created, I believe my mom helped me do this with limited assistance from others in my family. My mom is no longer living, so there is no way to check for sure. At the top of the page is written, "tune to Onward Christian Soldiers." I'm going to write the words here, and please feel free to use it if you want. Just give me (Don Shetterly) credit for the words. Most likely it was around 1975 when it was created. Dear Lord, we love you every day. And lift our hearts to you. you hear our prayers too. keep us ever faithful and make our lives complete. May you be thankful in whatever form that takes for you on this Thanksgiving Day. I hope that your thankfulness will extend beyond this day and become a daily experience. Be not only thankful but let your heart give the blessings you have to those who need a little help. Permission is required in writing before any part of this blog post is reprinted, reworded or used in any form. Growing up, our house was not one where we were allowed to challenge the status quo. What my father said was meant to be the law, and you did not object, argue, or ask for an explanation. Staying ignorant was the law of our house. We were abused under these rules, and we were molested and beaten and psychologically abused. Any attempt to circumvent or change that was met with punishment that was more harsh and severe and quick then one could contemplate. If you spare the rod, then it means you would spoil the child was the judgment of the court in our house. Yet, staying ignorant was the norm. Our minds were brainwashed under these rules. Even though we were urged to think for ourselves, it was not allowed. It was not given fertile ground to develop, and if you attempted to do it, you would be met with the "silent treatment." You were ostracized and put in the dog house for daring to stand up and challenge anything spoken. Sure, the king in charge of my family would act as if this did not happen. The family king would make a spectacle out of you, telling everyone that knew you, just how wrong you were. They took facts out of context and prove to others, that you had no idea what you were saying. No matter what was needed, they would ensure that you were the crazy one who dared stand up and speak out against the king of the house. Watching pets be killed or being told that if you dared to stand up, the cops would not be able to do anything for you proved that you had no choice. Learning that God would punish you if you challenged the king or he specially wanted you to just follow the will of the family is just how things were in our house. Staying ignorant was all we knew. While we heard others may brainwash us in their ways and beliefs, we were the ones being brainwashed and yet we did not know it. What seemed abusive and wrong to others, seemed normal to us. We knew no different. It is what we had been taught. When I finally got up the courage to stand on my own and walk away, I was labeled as crazy. It was the medication, the doctors, and my friends who led me astray. People that had known me most of my life were told just how far off the deep end I had gone. Staying ignorant was what they demanded of us. To this day, I'm on my own. I don't have contact with the ones that wished to silence me. I said enough is enough. Staying ignorant was no longer a choice, but it was so difficult to do. It took courage and strength to stand through the pain of the separation. It was not for the faint of heart. I'm glad I escaped and found my own life, but it took me many years to begin undoing the harm and brainwashing that was done to me. Staying ignorant is how the family wishes to remain, but no longer will I let anyone brainwash me. I work each day to become more than I am. I strive to go in and clean out the dark places of my life and let go of things that no longer serve me. It is a process to unlearn all that you were taught even if it was toxic and ignorant. It is not an easy process, and while many give up trying to do it, I'm glad that I am no longer staying ignorant. My life is much better as I grow in my own awareness and consciousness. Keeping someone down because of beliefs and control is no way for any human to live. Far too many times we think we're all alone out in the world. We believe there is no one else that has suffered through situations like we have. We see our experiences as isolating us from others, when in fact, many have also walked in similar shoes on the road of life. 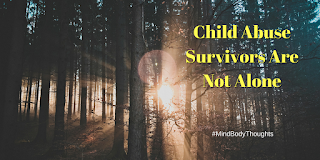 When I was first starting to deal with the memories of child sexual abuse, I thought I was alone. I didn't think anyone understood. I didn't know there was anyone else that had gone through these things. Boy, was I so wrong! In the early days, there were not the online resources that exist today. There was not a team of therapists and support people that you could reach out to for help. The internet was beginning to come alive, but resources were few and far between. I remember going to one of the first support forums for male survivors. The thing that this place helped the most was letting us all share our experiences and how we were struggling and dealing with them. When you started to read the things other members wrote, you began to see that you weren't alone. It was like a shot of a Hallelujah Chorus singing for all the heavens to hear. It was that powerful. When you go through abuse, even if the innermost parts of you can determine it is harmful and wrong, there's a part that says, "this is what is normal in life." When you are a child experiencing these horrendous acts, it blurs the line between what is normal and what is not. You carry that through into your adult years as if it is a conflicting truth which you have built your life upon. Knowing that others have gone through experiences I had and that the trauma and abuse were anything but normal, helps significantly in reconciling your life with truth. It is in that vulnerability that we come to know more of what the truth is. One of the hardest things for survivors of abuse is feeling like they are alone and no one understands. I'm grateful that there is a network of support out there for child abuse survivors. The tricky part comes in getting those to see that they are not alone and others will be there supporting them as they begin their healing journey. I can almost guarantee you that if you feel you're alone in what you are going through, there are others out there that understand this. When you meet that individual, you will find a sense of strength and determination in healing from the horrors of your past. It may not make the path easy, but at least you do not have to do this alone. These days I see people pushing one movement or another. I look at where we are told to "stand up to this issue" or "prevent this issue" or "bring awareness to an issue." But yet, I wonder if we really want to change. We give lip service that we do. We fill our Twitter and Facebook feeds with it, but then our actions portray just the opposite. Please don't mistake this blog post as being a political one, because it is much bigger than that. 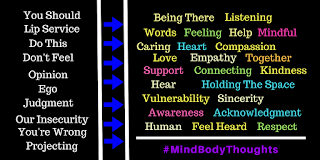 I am more focused on mind body health and healing. I've written some blog posts about intense and difficult subjects. These are often about the things that everyone wants to stop, prevent, change or bring about through awareness. Yet, when I share those online, the click rate to the blog post is barely existent. It appears that we want to help change the world and bring awareness, prevention, or support, but we really don't want to do much more than that. So, I have to question, do we really want change? I know... I know.. Everyone will say of course we want change. Of course we care about our issues, but unfortunately, actions speak louder. If all you're willing to do is retweet or like or share the fact that you are raising awareness, does that go far enough? In my view, I don't believe that it does. I don't even believe it means we have to protest or sign petitions. I'm not convinced that those always bring about the change we need. We may think we do, and there may be some evidence of it, but does it really do what we think it does? To me, it feels more like screaming and boiling water than actually doing something. After all, if you want to change the world, it begins with each one of us. It doesn't start by beating someone else over the head to see the world the way we do. It doesn't begin with bullying someone into believing the way we do. It starts with how we change our own lives in this world. It isn't just a thought process in what we think and believe. From deep within the core of the mind and body, it radiates out energetically as a vibration. What is genuinely within us is shown to the world. We may not be conscious of it. We may not be aware of it, but it is on display. Do we really want change? If we do, we'll support conscious behavior that helps others heal. We will quit focusing on the latest trending story of the day and look beyond to a bigger picture. 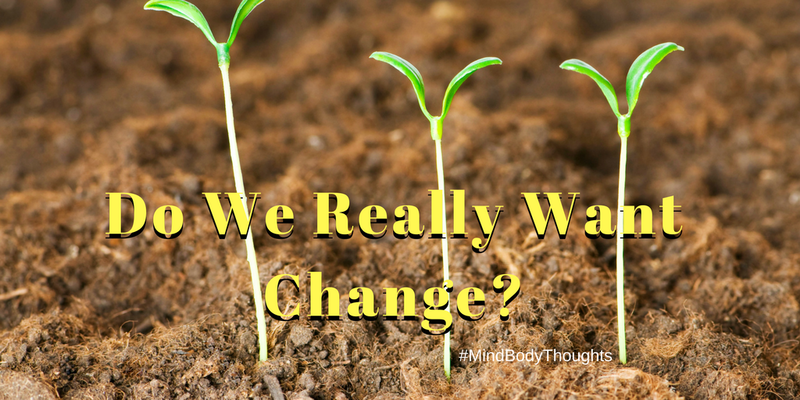 If we really want change, we'll start by examining ourselves from the deepest parts, not from our belief system. I'm not going to stop writing about the hard and challenging subjects. People may stay in the clouds and not read these things. That is their choice, but I'm not going to sit by silently. I'm not going to watch others be abused and remain silenced. This blog and everything I write is about pushing us beyond our comfort zone. It is about challenging our beliefs and opinions and current awareness. I strive to get people who read this blog to think about everything more and in a different light. We are following a dangerous path in this world, and we really need to ask the hard questions. I'll leave you with this question one last time: Do we really want change? If we do, it must begin with each one of us. 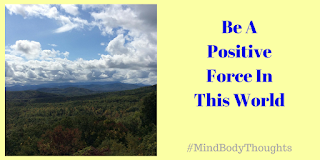 Let our mind body health and healing start within our own continued awareness of what is possible. Need A Good Webhost for Wordpress? I know this is off topic! Unfortunately, to keep the lights on, I have to do a little bit of this. So, I only promote products that I love and use, and that help me. This one happens to be a new web hosting company for my WordPress sites. Lately, I've been having major issues with a webhost that I've been with for many years. Most of the time, the webhost was good (LunarPages). In the past six months to a year, they just weren't cutting it for me. Their service was hit or miss and more miss than hit. The performance of their servers was really dragging my sites down. I tried to work with them. I really did, but the support responses were so poor that I felt frustrated. I signed up for their managed shared support and thought that this would help. Instead, I had someone try to lecture me about something on which they were flat wrong. Fortunately a supervisor stepped in and helped in that one situation. Anyway, I got tired of continual problems, lack of support, and performance issues on my sites. I started to look elsewhere, and fortunately, I found a place called SiteGround.com. I was nervous to switch, but when LunarPages messed up my account so bad at one point that I could not access my site, it was the last straw. I made the switch to SiteGround.com, and I have not regretted it. LunarPages did contact me after I left negative feedback and reviews about them asking if they could do anything to keep me and some clients as a customer. Unfortunately, I had tried to reach out to them many times, and they dismissed me, so in my mind it was too late. Plus the server performance was so much better for me that there was no way I was going back. The speed of my website and the WordPress dashboard are outstanding. When I go to my site, it loads quickly. There is no going to get a cup of coffee and waiting till it loads scenario. Customer support has been excellent. No, let me rephrase that. They have been outstanding. Not only did they follow up making sure I had my new account set up correctly, but they also helped when I had one thing I was not sure how to do. In seven minutes on live support chat, the customer rep had the issues solved and corrected. When I run GTMetrix.com on my account and start to look at page speed and performance, instead of my site taking 10 seconds to load, it now loads in about 2 seconds. It is the same site, just transferred from LunarPages to SiteGround.com. If you want to, you can apply for an affiliate account, which I did. In fact, if you click on the banners or links here, you'll be helping me out. But that's not all! Even if you do not want to be an affiliate, they have a referral code, and for every friend that signs up for hosting with SiteGround, you get three months free on your hosting plan. A nice little extra if you ask me! Don't just take my word for it, check out SiteGround.com and see for yourself. I've been extremely impressed with this place, and I'm in the process of migrating all my stuff over. I did sign up for the Go Geek plan with them because I have big plans for upcoming website development. If you need help with your own wordpress site, just email me.  I do build wordpress sites and I help people with SEO. I can also assist you in migrating your site from a host over to SiteGround.com . Do You Want To Be Concsious Online? I'm sitting here in frustration at the moment watching what happens online every day. I see it and keep hoping it will change, but the needle seems to be going in the negative direction. So, I'm left to wonder, do people want to be conscious? Somedays, it seems like social media is nothing more than a rant about political beliefs. The world could be ending in this very second, and all anyone seems to care about is the latest tirade on Twitter or the grabbing headline of the day. There is no in-depth analysis. It is what people hear that they regurgitate no matter how hard they try to convince others they make up their own minds. Sorry, the evidence shows the contrary. People want to be concerned about mental health, depression, suicide and anxiety among other health situations. I applaud this. I think it needs to be talked about, but far too often it means nothing more than a retweet or like on social media. The conversation doesn't continue. It only ticks up the counters in the tweet or post. I see this in stuff especially about suicide I have posted. It gets clicks, but that's as far as it goes. There are so many games played online with people where if you click this, I'll follow you back. Oh look, I can buy more followers. Oh look, people, see how much I can spend online to get a lot of retweets, likes, and comments. At the end of the day, what does that matter? What have you accomplished that changed your life or the world? Don't you dare say anything that doesn't fit into everyone's beliefs because it would be too uncomfortable if we could discuss with someone who holds opposing thoughts? It doesn't matter if it is hot-button issues or simple things, I've seen the sudden drop online because of it. I don't necessarily look for those that agree with me, but I just look for those that respect others. We can hold differing viewpoints, but we're still fellow humans traveling on this earth. Many people online act as if they have the only answer. They are the experts. They know the truth. There is nothing else or anything that they could possibly entertain. So, once again I ask, do people want to be conscious? I really wonder if people do because I see very few that attempt to do this. Some give lip service to it. Some make it appear they do, but it is the same thing as if you have a glass house thinking no one can see inside. It isn't about what other people want and what they do either. It is about each one of us and what we want. 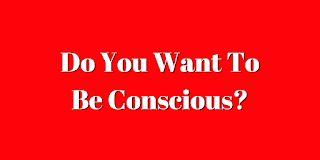 Do you want to be conscious? Are you willing to go the distance and be conscious? Are you ready to step away from all you know, all you have been taught and your beliefs to be conscious? I mean, are you ready to challenge everything you know and drop what no longer serves you? No, I don't say you do this if it agrees with you, but if it makes you uncomfortable. I mean, if it makes you question things that are not easy. It is where we begin to find consciousness. We do not find it in the safety of our routine lives. I posted something about the topic of what is truth. One person immediately without reading it said it is a religious thing. They did not even entertain what the blog post was about but was so quick to state their belief rather than be informed. They diminished what was written by their own unconsciousness. They were not showing love or compassion or understanding. So, once again I ask, Do you want to be conscious? I'm not going to let anyone off the hook on this blog post. I know this is a hard question. I know we want to say, of course, we do, but in all reality - is that true? I too struggle with this daily, and I think that is a good thing. If you want to be conscious, but you don't wade into the water, you may need to work on being more honest with yourself. See, we fool ourselves into thinking that we are more than what we are. We kid ourselves into believing that we have everything together while we hide and ignore, numb and disconnect to what is the truth around us. Consciousness is not just a thought process. It means being connected to our mind, body, emotions, thoughts, and the higher spiritual side of where we fit in this world. Consciousness is not just a meme we retweet or the fake smile we paste on our face. It is more than spouting our own beliefs as if everyone else should think like us. It is deeper than we currently see and if we think we are conscious, we most likely are a long way off. Consciousness means we go in and become aware of all parts of our life, even the most uncomfortable ones. Where fear is afraid to tread, that's where we go to become more aware and conscious. It is up to each one of us how we live our life. If we spend every waking minute worrying about the latest tirade of the day, we're not helping the world. We're adding to the problem. The world and human civilization have serious issues, and it is looking for people to step up to the plate and help solve these problems. Unfortunately, we have a world that is screaming at one another. Nothing is being resolved. Do you want to be conscious? It isn't a yes or no answer. It is how you live in a day and what you do through your actions that give the answers. It is where you focus your time and help and love, not just how much you act as if you do. Conscious means doing more and being more than you were yesterday and not as far as tomorrow. It is a daily commitment, not a one time retweet or like or post. I write because I want to see the world and human civilization wake up. No, I'm not referring to politics or religion. I mean, waking up from the inside out. Learning how to live not only in your mind but in your body. Seeing that your life is led by a heart that is fully open, not close or semi-open from the trials of life. I write because I want to make a difference. I don't care about many of the issues most get frantic about these days. Those are temporary unconscious events that only bring out the worst in people. I'm more concerned with how you deal with your health and mental well-being. The overall love and acceptance of others are what matters to me, not the judgment and condemnation we shove in other people's faces. Do you want to be conscious? If you do, make sure your actions and thoughts and your words work in that direction. See the big picture, not the moment by moment parts of life that do not advance the civilization of this universe. See that consciousness begins deep inside of you and radiates out for all to observe. I'll leave you with this question one last time because I just want you to think about it. The answer is not as important as the process of contemplation. Do You Want To Be Conscious? I learned recently that Tom Petty passed away. I did not know his music for a long time, but when I found it, it meant the world to me. During that particular period in my life, it spoke to me like very little music did. One of his songs that is an inspirational help to me is "I Won't Back Down." When I first heard this song, I was going through horrible moments in my life. I was just coming to terms with the abuse I had gone through. It felt like everything was against me, including my family and life itself. The lyrics state "you can stand me up at the gates of hell, but I won't back down," and that's exactly what it felt like to me. It was hell in my life healing and coming to terms with what had been done to me. If you've been through childhood sexual abuse or torture, you most likely understand the things I am saying. In another line, the song goes, "Well I know what's right, I got just one life. In a world that keeps pushin' me around, but I'll stand my ground." At that moment of my life, I felt like I was being pushed around, but I still knew what was right. I had a CD of songs that I played which I called my empowerment songs and "I Won't Back Down" was one of them. Whenever I felt like I wasn't making it or I needed a boost in life, I would play this CD. 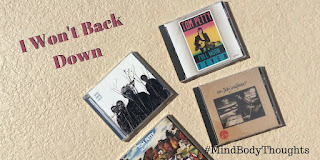 Tom Petty's song helped me see that no matter what I've been through, I Won't Back Down. He kept me going when sometimes that was a huge mountain to climb. 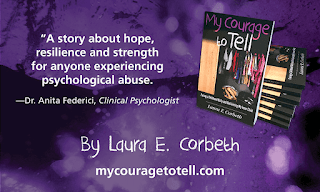 Healing from childhood sexual abuse and torture was and still is not easy at times. It feels like pure hell. Often it feels like you won't make it through all the pain or be able to stand when it is over. That's where I believe what Tom Petty says, "You can stand me up at the gates of hell, but I Won't Back Down." I am sad to hear he passed away. He will forever be missed in my heart and the hearts of many. The world needs more people in it like him who see life for what it is, not what we're led to believe it is. So even though Tom Petty is no longer with us on this earth, I'll say, "You can stand me up at the gates of hell, but I won't back down." Oh no, I won't back down. Today's post highlights an interview I did with author, Laura Corbeth. She is the author of the book, My Courage To Tell and I highly recommend this book. She shares how she got through her own experiences of bullying and psychological abuse. 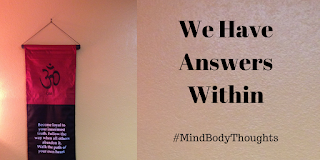 The interview is posted on my other site, Mind BodyThoughts.com so go check it out. Hopefully you get a chance to go check out her book on Amazon. I really enjoyed reading it. I see this happen all the time. I saw it way back, on one of the earliest little forums for people helping others. We tried to learn how to own up to our own insecurities and be empathetic with others. We tried not to respond with judgment, even that which was inadvertent. Yet, I still see the same thing practiced today that I saw back then. Everyone wants to preach at another person and tell them what they should do. Rather than telling themselves, they make sure everyone hears what they are doing wrong. Often times, I think we are really telling ourselves what we should do, while we make our response out to be for someone else. It is a subtle distinction but very powerful and very preachy. I'm sure I probably fail in this at times on this blog. I try hard, but sometimes, it just happens. However, I do find that if I share some of my own struggles and become vulnerable with others, it means so much more to them than if I started telling them what to do. 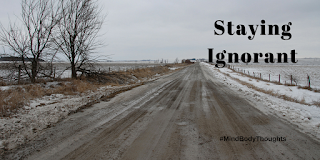 Saying that you should do this or you should do that does not connect as much as if I share my own struggle and how I got through it. We resonate deeply with others when we know someone has walked through the fire. When it is hard to determine that, we're not as inclined to hear. When we feel the slightest ego or judgment, it is then that we say, "I'll figure this out on my own," and we tune others out. There are far too many in this world, and especially online, who are quick to judge and tell you what they think you should be doing. It is an epidemic, and with social media, it happens in an instant. Everyone has an opinion, but these days, it is turned into belief and fact, without consideration that not everyone sees things the way they do. It is okay if we all see things differently because together it makes us stronger. Healing and helping are about putting your arm of compassion around someone and saying, "I'm here for you." It is about checking your own issues, cloaked in judgment, at the door because they help no one. If you respond through your own wounded self and ego, it is not a healthy connection. Yes, I know we are all human, and we're all learning. We are probably never going to get this right 100% of the time, but I believe we need to put a much greater effort toward it. If we want to be human, we need to focus on where our responses to others originate. So, let's try something. Just for today. When you talk or write back to people, whether it is in person or online, how are you genuinely coming across? Are you connecting with an arm of compassion and love, or is your ego making sure that your opinions and beliefs are being forced upon others?